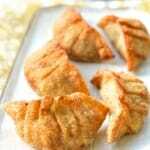 Songpyeon, half-moon shaped rice cake, is a must-have Chuseok delicacy. 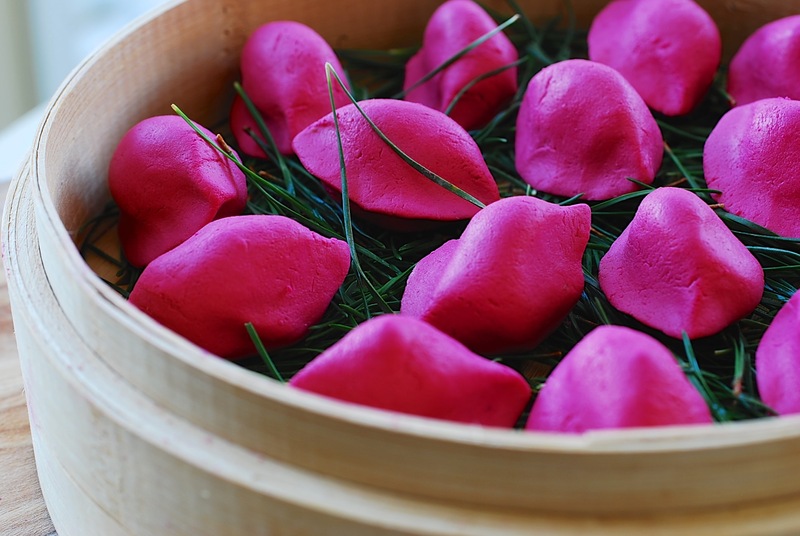 The sweet, earthy flavor of beets, and their vibrant red color works beautifully with the songpyeon dough. The weather has cooled down, the trees are changing colors, and the persimmons in my backyard are ripening. I absolutely love this time of year! This weekend, we Koreans are celebrating Chuseok (추석). Also referred to as Hangawi (한가위), it’s a mid-autumn/harvest festival, which takes place on the 15th day of the 8th lunar month. Families gather, give thanks to their ancestors, and enjoy a great time together sharing abundant foods. As the old Korean saying goes, “No more, no less, just be like Hangawi”! Enjoy this beautiful, bountiful season! 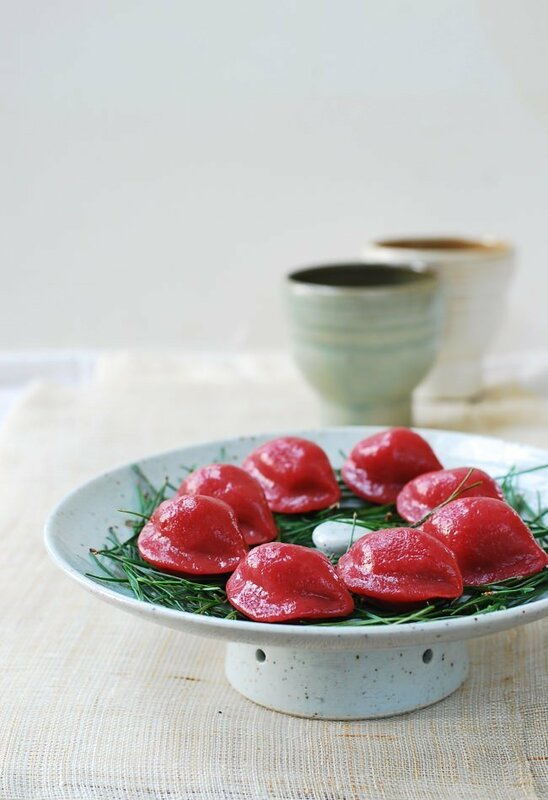 Songpyeon (송편), aka half-moon shaped rice cake, is a must-have Chuseok delicacy. 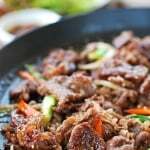 I previously posted my songpyeon recipe with several natural food coloring options. Here’s another option for you! I love the sweet, earthy flavor of beets, and their vibrant red color works beautifully with the songpyeon dough. 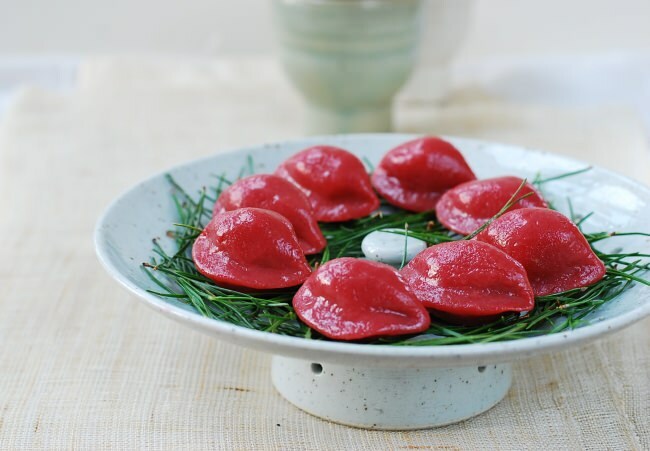 Songpyeon is stuffed with a sweet filling and traditionally steamed on a bed of pine needles, hence the name songpyeon (“song” in “songpyeon” means pine tree). Read more. 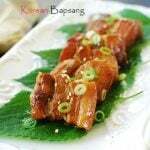 Visit here to find other Chuseok food options. On an unrelated subject, if you remember reading my KCON 2015 LA experience this summer, I said I filmed a video with Buzzfeed’s – The Try Guys. I was beyond ecstatic to see it released last night! I hope you enjoy it as much as I did. Roast the beet in the oven (about 45 minutes at 400 °F), and purée in a blender as fine as possible. Sift the rice powder into a bowl. 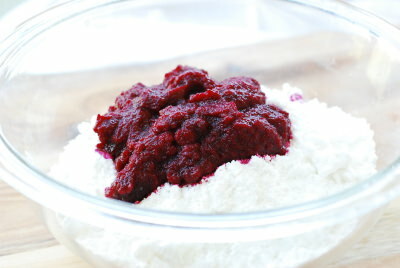 Heat the beet purée until hot in the microwave and add to the rice powder, quickly stirring it in with a spoon. Knead, pressing and stretching with the heel of the hand. Fold and rotate the dough. Repeat the kneading process for at least 5 minutes. 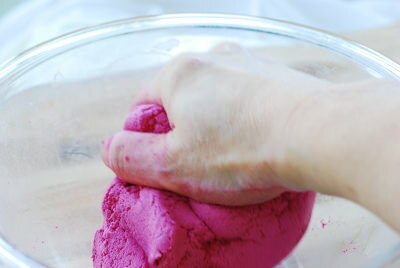 (If the dough sticks to your hands or the bowl after some kneading, it's too wet. Add a little more rice powder. If the dough breaks easily or is too stiff, it's too dry. Add more beet purée or boiling hot water in 1 teaspoon increments.) Cover the dough with plastic wrap or a damp towel. 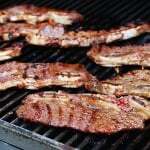 Let it rest for 20 to 30 minutes. Roughly grind the sesame seeds in a grinder or blender. Add the sugar, honey, and pinch of salt. Mix well until the honey is evenly distributed. To assemble, tear off a small piece of the dough enough to make a roughly 1-inch ball. 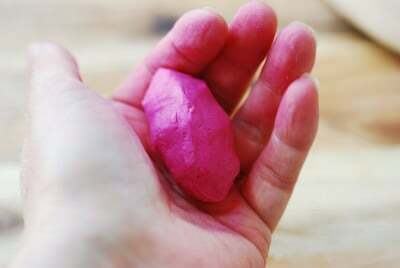 Roll tightly between your palms to shape a ball. Make a well in the ball by pressing into it with your thumb, and press outwards, with both of your thumbs, on the inside walls of the well to slightly expand the opening. Place 1/2 teaspoon of the filling in the well and press it down. Seal tightly by squeezing the edges together. Squeeze the whole rice cake lightly in your palm to firm it up and roll gently between your palms to smooth it out. Shape it to resemble a half moon. Repeat until all the dough/filling is used. Boil water in a steamer. 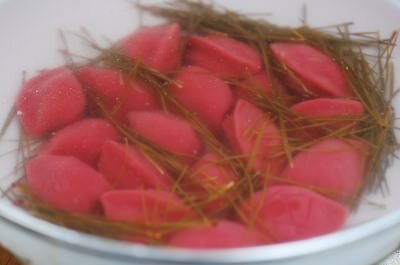 Place a thin layer of pine needles or a damp kitchen cloth on the steamer insert. Boil the water over high heat. When it starts to steam, place the rice cakes on the steamer insert without the pieces touching one another. Cover with a thin layer of pine needles, if available. Cover and steam for 20 minutes. Prepare a big bowl of cold water. Remove the rice cakes from the steamer, and drop them in the cold water for a quick rinse. Transfer the rice cakes to a colander to drain. 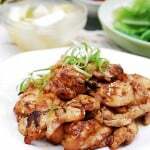 Lightly coat your hands with the sesame oil and rub the oil on the rice cakes in batches. A 2-pound bag yields a little more than 6 cups, which is sufficient for 3 batches. The frozen rice powder for rice cakes is usually pre-salted. Be aware that the moisture content of the powder varies depending on the brand. The video was pretty funny. You looked a bit nervous watching The Try Guys making ddeokbokki. But I can see that you enjoyed filming. You’re so natural at this! Hi Hyosun! I’m from Singapore and I chanced upon your website while reading up on Korea, and love what you are doing here! 🙂 I’ll be visiting Korea in a week or so, and would be bringing along my 18 month old baby. Was just wondering, if you recommend Samgyetang to toddlers of this age? Do Korean mummies feed ginseng chicken soup to their babies? 🙂 And do you have recommendations for what toddlers can eat in Korea? 🙂 Thanks so much in advance! Thank you, Zhen! That’s nice you get to go to Korea. 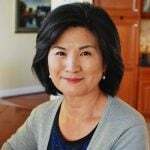 I know Korean moms do. There should be all kinds of mild soup or porridge at Korean restaurants little kids can eat. Korean kids enjoy gimbap. Toddlers generally like some rice wrapped in gim (dried seaweed). Also, most restaurants serve many complimentary side dishes along with your meal. 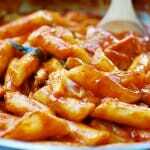 Some of those side dishes will be child-friendly as well, such as egg dishes, jeon (pan-fried egg battered dishes). 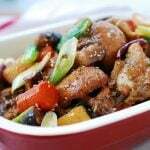 Korea also has a lot of chicken dishes kids love. Enjoy your trip!